What Kind of Foam Pet Bed Does My Dog Need? – Foam Factory, Inc.
What Kind of Foam Pet Bed Does My Dog Need? When shopping for a foam pet bed, you’ll be confronted with a bewildering array of foam types, densities, and shapes to choose from. Assuming you’re not an expert on the different benefits of each kind of foam, you could conceivably spend hours trying to figure out which pet bed your dog needs. To help shorten your research time, FoamFactory.com has put together this brief foam pet bed buying guide. Memory foam does for dogs exactly the same thing it does for humans: provide contoured support at joints and other key pressure points. 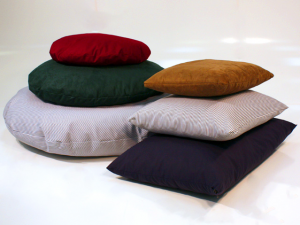 This property makes memory foam pet beds an ideal choice for senior dogs who may be suffering from arthritis and general stiffness, as well as for larger breeds with a history of hip problems or joint pain. When shopping for a memory foam pet bed, stick to quality foam with a density of at least 3 lbs, to ensure performance and longevity. Rectangular eggcrate foam pet beds are very breathable and much cooler than other types of foam pet beds, so they’re especially welcome in the summertime. The eggcrate style cut of the foam naturally promotes airflow so it doesn’t retain heat like memory foam or fleece. And because eggcrate foam is a much more affordable option than other types of foam, it is particularly suited for outdoor kennels or dog runs, for puppies not yet out of the chewing stage, and for similarly rugged applications. Made from shredded memory foam, this type of pet bed is perfect for dogs that like to burrow in while sleeping. The shredded foam is dense enough to provide good joint support, but is also able to move around within the bed cover to allow your dog to satisfy its nesting instincts. This combination of support and snuggly comfort will give your pet the best of both worlds. No matter which foam pet bed you decide to buy, it’s important to get the right size. The rule of thumb for beds is that your dog should be able to stretch out fully, with a bit of space to spare. Experts recommend measuring your dog from its nose to the tip of its tail and adding 5 inches to determine an appropriate foam pet bed size. Once you get the correct measurement, you can visit FoamFactory.com to place your order.